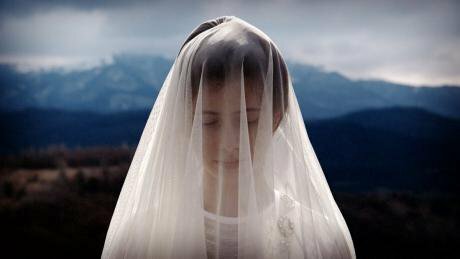 Grozny Blues is a haunting, often dreamlike documentary about Chechen people caught between the contradictory pressures of manufactured realities and coerced silences. Right from the beginning, as the film opens with a quotation from Bertolt Brecht, ‘It said in the papers this morning that a new era has begun’ it is clear that director Nicola Bellucci’s documentary Grozny Blues, a masterful work about contemporary Chechnya, is fixated with contrasting today’s Chechnya – the Chechnya of Ramzan Kadyrov – with Chechnya’s past. The heroic significance of these women’s work becomes clear when considering the social and political environment in today’s Chechnya. Kadyrov, after assuming the position of head of the republic in 2007, continues to promote pro-Russian ideologies in exchange for support from Moscow. He has balanced elite interests by co-opting them, stabilised the economy, and ruled through his notorious security forces. His total dominance requires absolute allegiance and silence about anything that criticises either the Chechen or Russian regime. The women’s footage, unique and rare, emerges as even more precious with this background – it highlights their efforts to preserve memory as an act of resistance to that dominance. The building these women work in is also home to a blues club, called Blues Brothers. We are introduced both to the youth who frequent it, as well as the club’s owner – a man in his 30s or 40s, who keeps packs of gum near the cash register to give out when he runs out of change. We watch the clichéd disagreements across generations between the owner and a young man who frequents the club (e.g. ‘I listen to real music, not heavy metal!’). These scenes constitute an exhilaratingly rare glimpse into a small Chechen subculture, where spontaneous networking, relaxation, and music-making occur, where authentic social repertoires away from the gaze of the state are imagined and articulated. 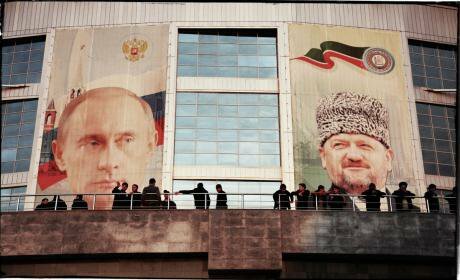 Former President of Chechnya Akhmad Kadyrov and Russian President Vladimir Putin survey the streets of Grozny, Chechnya These youth hardly remember the war, but must navigate a society that is forged and defined by it. Their generation seems more socially conservative than the owner – a product of the era of Ramzan. In speaking about girls they like on the street, the young men generally agree they prefer girls with headscarves. On the other hand, the owner recounts his past romantic pursuits, one by one, by first name, laughing self-consciously, explaining, ‘There was freedom then.’ In showing these moments, Bellucci contributes to an uncommon examination of the tensions of the personal with the political, the intimate and the institutional. Bellucci intercuts his footage of the women documenters and their recordings of a destroyed Grozny from the 90s, with the blues crowd, and present-day footage from public spaces, where Kadyrov’s image and legacy dominate. The effect ought to be befuddling, but instead we are given a more holistic account of actuality, making the otherwise unseen strand connecting the past with the present more self-evident. A recording from the 1990s of a car passing under a ruined bridge is juxtaposed with contemporary footage of that same bridge – now rebuilt and refaced. The result is an intimation of how recent the war really was. It becomes clear that those who do not share Kadyrov’s view of the ‘given’ or the ‘natural’ origins of Chechens’ values and national disposition are rejected from the national narrative. By maintaining control over social representations, Kadyrov retains control over the dynamics of national identity, a situation, which highlights internal divisions among the Chechens on a religious basis while simultaneously reducing the political tensions between Chechens and Russians – something Kadyrov has exploited to his benefit. This advantage to Kadyrov has come at a heavy price for the rest of the republic – the price of self-expression. Bellucci exactly captures the silence that permeates everything in Chechnya – the reluctance of children to talk about whether they experience injustice at school, the empty house left behind by one of the women protagonists before she was forced to leave Chechnya for Belgium, and the photographs of the families of the missing and the murdered. We meet an elderly but sprightly woman who displays the numerous posters she has preserved of former president of Chechnya, Djohar Dudaev; before bidding the film’s crew farewell, she tells them not to say anything about what they have seen there (something that leaves you wondering if her consent was obtained to show the footage). As she sees the crew off, telling them to go in peace, she makes a gesture with her hand over her mouth. A young woman at the blues club with short hair and a deep, soulful voice, looking as though she stepped in straight from a 1960s garage rock art collective, wants to sing, but isn’t allowed by her parents to stay in the club past 5pm. It is perhaps in these silences that we see the most valuable, daring exploration of Chechen society’s tensions, between the pacification of a people and their resistance, destruction and reconstruction, patriarchal tradition and realisation of self.